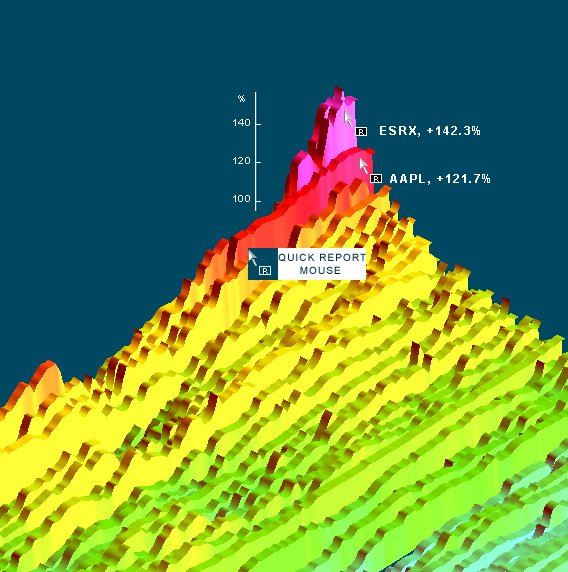 With our new product StockMap3D you can bring power of scientific data visualization to your stock market trading. 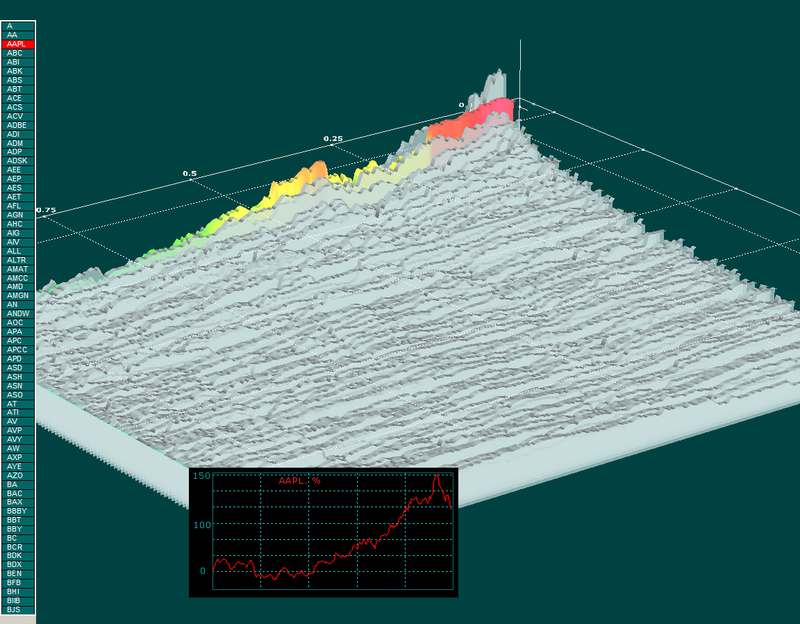 We have developed advanced 3D visualization suite that is much more powerful than common 2D charting. Enhancing the visualization to the 3rd dimension offers natural human perception for instant data evaluation and assessment. Our software can plot several hundreds stock charts on the same screen in real time for fast and easy analysis. 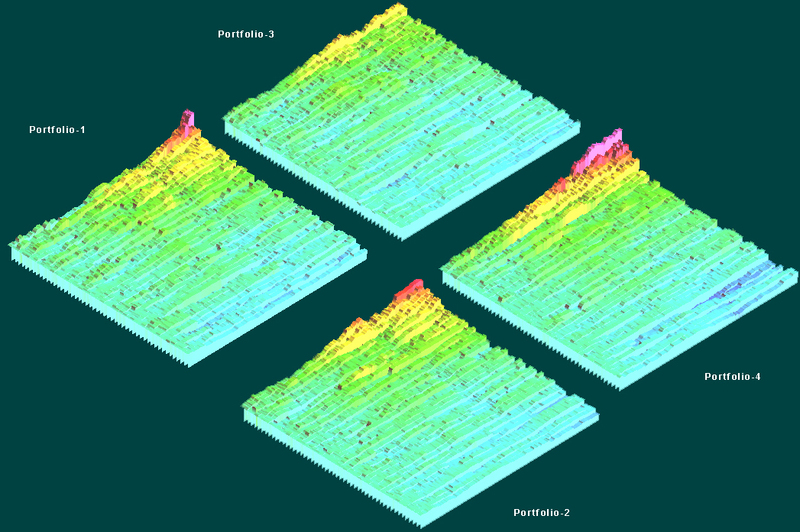 The new 3D approach offers you virtual reality scientific grade type of graphics that features: high level of intuitive interaction, 3D and conventional charts, multiple portfolio views, real time rotation, data zoom, data drilldown, mouse driven data of interest reporting and much more. If you want to see what is up on financial market with maximum possible information at the same time, then StockMap3D is the best tool for you. On the screen shots below we demonstrate several hundreds of stock plots together understandably scaled and compared to each other. Any standard charting package will limit you with 10-20 plots on the screen, more plots just turn to mess. We have developed the package using ideas of investors who was looking for better representation utilizing obvious advantages of 3D graphics over 2D charts for stock market analytics. 3D visualization of multiple stocks with interactive reports. Multi-data 3D chart combined with several conventional 2D charts. Ongoing monitoring, valuation and comparison of several portfolios of investment. Multiple markers for critical data tracking. Interactive reporting, mouse move and get data of interest instant read out. Mouse click and get report tools. Multiple symbols comparison with detailed data drilldown. Interactive markers: move and get standard stock chart of customizable options. Asset and portfolio managers, market makers, stock traders, market advisers deal with an overwhelming amount of information on a daily and hourly basis. The financial market analysts and traders need better tools that give a single point of reference to provide critical information that matters the most in stock analytics. Real time stock data of the interest consists of 10's to 100's symbols that should be followed in time and relationship with other important market factors. Large quantities of numerical data are virtually impossible to understand quickly and accurately unless one uses some sophisticated software tools to do this. Fortunately the power of nowadays computers can significantly simplify and automate the process of critical decision making, provided that right software is used for financial market analytics. The fastest way for the human brain to absorb large quantities of data goes through some visual model. Our human visual perception system has the ability to understand pictures much faster than that of the tables and ticker screens. Through the Visualization of the data into the pictures, using color, height, shape, shadow, etc., one can discover the complex relationships between large data sets. Since many years ago, scientists have discovered that the data visualization is one of the most critical point of the whole analysis process. We believe that the data visualization is "the art and science". Good visualization model can help you to turn complex data set into meaningful visual insight of a high impact. There are many examples of data visualization applications that help people in the fields of science and engineering. Scientists use visualization, for example, to forecast weather, analyze experiments, and discover new phenomena. Engineers use visualization to make better products. Mangers use 3D visualization to get fast assessment of the input that evolves the critical decision. In all those fields a typical trend is the same: the better you can visualize data, the faster and more accurate you make your critical conclusion. Now we trust time is right to convert scientific approach of visualization into helpful financial analytics tools. While common stock chart tools will try to convince you "to choose and scan the financial stock market data with some criteria", our 3D stock market visualization system just will let you show all the data together, that is obviously the best possible approach. Our graphics provides you with sorting and organizing of the 3D data price sequences into: indicators, price patterns, gain, volume, most actives, top gainers/losers, big range, gap Up/Down, Industries/Sectors and more... And of coarse, the most important for you is our willingness to provide you with with any custom pattern. The technology provides professional traders, analysts, asset managers and senior management with consolidated advanced 3D views of their information. Example::Aug 2007:: Sample DivX based AVI movie. Stock crash as 3D Movie :: Note you might need CODEC to play this film. Get it here DivX free version 5. AATI is used under license and is a registered trademark of ATI Technologies Inc. in the United States and other countries.